I was at NATO when Russia invaded its neighbor, Georgia, in August 2008. The action caught anyone not paying attention by surprise. The experts knew it was long in coming. I’m sure the same is for the unfurling crisis in Ukraine, which nonetheless doesn’t help us steer a course away from general war on the Black Sea, the doorstep of the European Union. At the time of that short, brutal war I remember there were many calls for NATO to intervene and a tremendous amount of frustration that the Allies did not. But a French colleague pointed out to those of us assembled in my division — we were short-staffed during the August holidays — that NATO’s contribution at that point was not to inflame the situation but to defuse it. The European Union, led by French President Nicholas Sarkozy, led the political charge to end the war within a week. I remember a little-noted post scriptum to that war — NATO’s inadvertent (I think) contribution — that may be useful to keep in mind in this crisis. That was the introduction of the NATO Standing Maritime Group 1 into the Black Sea after fighting had ended. SMG1 entered the Black Sea on a planned and routine patrol — either it was deliberately allowed into this highly primed theater or nobody thought to turn it back — and the Russian reaction was hysterical. After the Russians sank the small Georgian fleet and basically did what they wanted across the country, SMG1 fundamentally altered the force dynamic in the theater. SMG1 really got the Russians’ attention, and it suggests to me that Moscow will never pick a fight with an equal or superior adversary if it can avoid it. It’s probably obvious, but an excellent commentary by Radio Free Europe/Radio Liberty noted that the territorial grab in Crimea is not an isolated action but opens a second political front for Moscow. The revolution in Kiev was a green light to similarly minded activists in Moscow that thuggish regimes have their weaknesses, especially if the military can be sidelined. By mobilizing the armed forces against Ukraine, Russia both moved to crush the nascent west-leaning government in Kiev and communicated clearly to the domestic Russian opposition what consequences would follow for attempting to duplicate what happened there in Moscow. This action also plays into the Kremlin’s interests by forcing our eyes off of other crises where it has waning influence, like Syria and Iran. Moscow can continue to back its client state and Damascus can destroy its internal opposition and rebellion (and weaken its neighbors with refugees) while we are diverted by Ukraine and Crimea. But we are powerful enough not to be distracted and must continue to pressure Syria and Iran while also resolving the crisis in Ukraine. While Russia may look strong at the moment, it’s important to recognize that the country is acting from a position of weakness — and that the country’s action in Crimea is a fundamental and tremendous risk. If the Kremlin fails in Crimea or Ukraine, the weakness of the regime will be virtually impossible to ignore. No amount of propaganda about fighting fascists and the intransigent enemies of Russia will be able to cover for a failure of this kind. And with this failure, the domestic Russian opposition to the Kremlin will feel emboldened to move against the regime just as the opposition did in Kiev. So instead of being in a position of strength, in reality the Kremlin is extremely exposed. When Vladimir Putin fails, he will lose everything. So he can’t afford to fail, which is what makes this crisis so particularly dangerous. Another reality I learned from the war with Georgia was the entangling nature of Russia’s relationship with the West. I think we were far more worried about this state of affairs than the Kremlin, but it was important and interesting (if not a little infuriating) to stop and deliberate on all the ways that NATO (and more broadly, the United States and the European Union) cooperated with Russia on issues and initiatives of mutual interest. We on the NATO staff literally cataloged all the ways we were working together with Russia, which still has a diplomatic mission on the same compound at NATO Headquarters. At that time, we were working together on overflight rights for resupply to to Afghanistan, nuclear disarmament (both START and the more concrete aspects of securing fissile material), ballistic missile defense, anti-piracy, anti-terrorism, energy security, and the High North. We’re still working with Russia on all those things, more or less — not least or more recent of which was the successful execution of a safe and secure Winter Olympics. All of these issues of mutual interest (and undoubtedly more) are on the table if we escalate this crisis. It’s important to consider that the political situation in Ukraine may not be as polarized or volatile as it appears. Consider the map at the top of this post. Much as been made about how the country is split between western Ukrainian speakers and eastern Russian speakers. But a view of a linguistic map (and the CIA World Factbook) demonstrates the picture is far more complex than that. 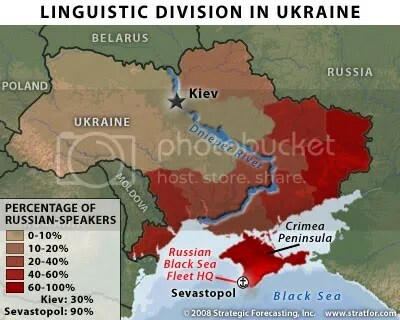 First, Ukrainian-speakers and Russian-speakers blend fairly evenly throughout most of the country, especially in Kiev. The exceptions are the extreme west and extreme east. Second, Ukrainian-speakers are the outright majority in the entire country. Only in the south and the far east do Russian-speakers hold something close to an absolute majority, which explains in part why the Kremlin seized Crimea (which includes Sevastopol, home of the Black Sea Fleet), first. So the larger lesson is: don’t take the linguistic or ethnic divide as concrete or immutable. Nobody has polled the Ukrainians about this situation. Nobody knows how much Ukrainian-speakers and Russian-speakers have intermingled and inter-married. Nobody has even bothered to ask them much about what’s going on in their country. Only the most radical elements are speaking out. Do we want to make decisions about war and peace and secession and rebellion based on what we see on television or have read on the Internet just in the last few days? Deliver $15 billion in loan guarantees to secure the country financially. Grant Ukraine and Georgia Membership Action Plan (MAP) status, fast-tracking the countries for NATO membership. Finalize the Eastern Partnership with the European Union. Prepare to ship LNG to Ukraine (and Romania and Bulgaria). Prepare to airlift humanitarian, medical and food supplies to Ukraine. Impose sanctions on Russia’s leadership. Prepare to close off European trade with Russia. It’s important to know that the force differential favors Ukraine in the East-West face-off. While Ukraine may be at a disadvantage right now facing Russia, Ukrainians are fighting on their own territory and with the support of the West. A variety of military options are available to NATO and Ukraine’s European backers. I hesitate to offer them here because I am not an operational or regional expert. But suffice to say NATO controls access to the Black Sea and the North Atlantic, and could control at will the airspace over the Black Sea. The Russian Black Sea Fleet is made up mostly of anti-submarine ships, which are vulnerable to surface combatants and aircraft, and as one observer noted, “The Italian navy alone could easily destroy it.” Any action taken by NATO or even by any individual Ally would fundamentally alter the military balance in this nascent conflict to Russia’s detriment. But getting to a point I made earlier, that’s what makes this conflict so potentially dangerous. Putin can’t afford to lose. And the escalation ladder goes right up to the nuclear trigger. While I think cooler heads will prevail, and I think it’s possible for everyone to fight without drawing in that option, those are the stakes involved. Indeed, that has to be in the back of everyone’s mind, if for no other reason than that was how one proxy war was brought to a close. The 1973 Yom Kippur War ended when the United States put its nuclear weapons on worldwide alert following a Soviet resupply to the embattled Arab armies. The alert got Moscow’s attention, and, not willing to escalate the crisis, both superpowers forced their proxies to the negotiation table. But in this situation, can we be sure the bluff won’t be called? This entry was posted in North Atlantic Treaty Organization, Politics and Political Theory and tagged Black Sea, EU, European Union, force, international relations, NATO, politics, propaganda, repressive regimes, Russia, totalitarian regimes, Ukraine, Vladmir Putin. Bookmark the permalink. It occurs to me that by sending troops into the Crimea, Putin has notionally acknowledged the “loss” of Ukraine as a Russia satellite. He clearly felt that the Russian navy base there was at risk, and so sent troops to secure it. Tactical victory perhaps, but strategic loss for Russia. Europe “gains” Ukraine, but only if it acts boldly as you suggest.